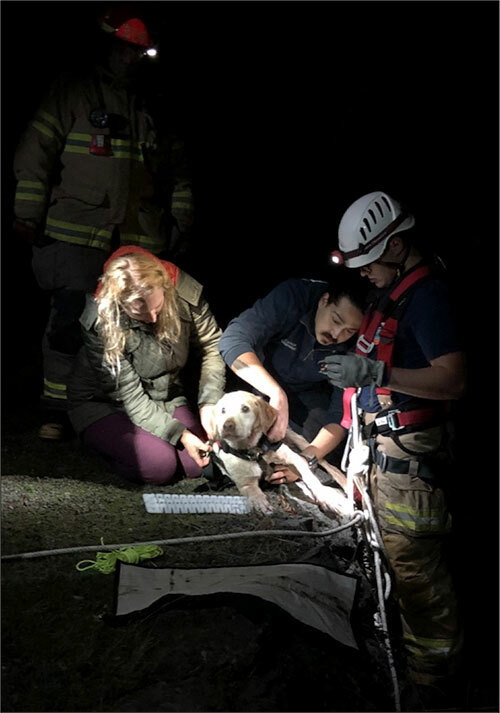 When Cowboy toppled down a 30-foot cliff Monday night, San Juan Island Fire & Rescue Firefighters were there to save him in the dark of night. Gretchen Bailey said her hearing and vision-impaired 14-year-old golden retriever got confused and ended up falling down the cliff on the island’s west side before she could reach him. Firefighter Craig McConnell and Lt. Michael Henderson rappelled down the rocky wall to Cowboy using an intricate rope and pulley system set up by several firefighters. The rising tide was beginning to splash onto Cowboy who lay there motionless, tired and scared when the firefighters reached him. “When we approached Cowboy, we were in six inches of water, and by the time we were secured and ready to go up, we were in three and a half feet of water,” said Firefighter McConnell. Bailey said the veterinarian was unsure if he would ever recover, but Cowboy is now walking up and down the stairs unassisted. San Juan Island Fire & Rescue, primarily a volunteer department, is looking for islanders to join our ranks. “The dedication and professionalism of the men and women who serve our community as firefighters or support members is evident in Monday night’s rescue. Being a part of our dynamic team is a great way to help those in need; be they two- or four-legged,” comments Fire Chief Norvin Collins. Applications are due by November 29th. Classes run on weekends January through April. For more information, call 360-378-5334, email Asst. Chief Monin at training@sjifire.org, visit http://sjifire.org or stop by the Mullis Street Fire Station at 1011 Mullis St.
San Juan Island Fire consists of about 45 volunteer firefighters, 17 volunteer support member and 6 career firefighters and has been serving the community for 60 years now. Hero’s among us! Well done, San Juan Island Fire Rescue Firefighters.